Dolceoro Medical Alert ID Bracelet, Italian Modular Link Style Bracelet. ••• Dolceoro Modular Bracelet: Modular bracelet mean that you would be able to take off or add individual link (Charm) from or to this medical alert bracelet ID to adjust this bracelet to your desired wrist size. This enables you to change your medical condition in future if and when your condition changes without needing of buying a new bracelet. 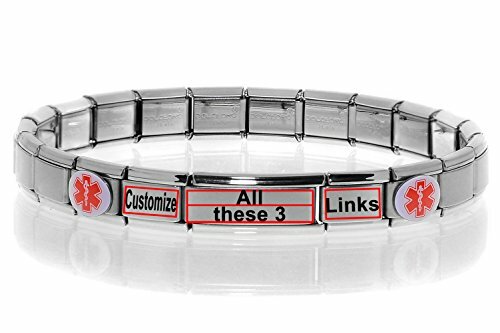 You could personalize or customize your medical ID bracelet with your unique medical condition. This technology “Stretchable Bracelet” gives elasticity and comforts you need to put on or take off the bracelet with ease. ••• Laser Engraving: Engraving is in permanent black color with deep impression over satin surface of stainless steel. Writings are clear and detailed. Your Medical ID Bracelet could help and lead to a proper and faster care for you in case of an emergency situation. Majority of the medical professionals, doctors, and emergency responders are trained to look for Medical Bracelet such as this! There are no chemicals used, therefore it will not fade. Just make sure to remove any cloth lint from its surface (use a scotch tape). We also make Individual “Customized Laser” in both standard and Super Link Charms that can be added to your bracelet and to cover your special needs. Please view online videos if you are not familiar with these Italian Modular Charm Bracelets. EMERGENCIES: Your Medical ID Bracelet could help and lead to a proper and faster care for you in case of an emergency situation. Majority of the medical professionals, doctors, and emergency responders are trained to look for Medical Bracelet such as this! ELEGANT AND FUNCTIONAL: This Modular Bracelet gives you flexibility to add or to remove links (Charms) from your bracelet, adjust it to your wrist, or have the freedom to change your medical conditions in future if needs be without requiring a new bracelet. This technology "Stretchable Bracelet" gives elasticity and comforts you need to put on or take off the bracelet with ease (see image illustration). SIZE, FITTING, ADJUSTABILITY: This Modular Bracelet could be sized to any wrist circumference you wish. Use the sizing image provided for this listing to identify your desired bracelet size for your wrist. Should you still need additional links, you could add more links, or use your favorite charm links from your current 9mm Italian charms bracelet. All 9mm Italian charm links have the same width and are interchangeable with each other. CONTENT & VISIBILITY: The Medical Insignia charms are placed stylishly apart pointing to your Medical condition in a subtle, yet effective way especially when your bracelet turns around. Their bright colors and the contrast backgrounds are easy to spot. It is accompanied with Satin Modular links to form your bracelet. If you have any questions about this product by Dolceoro, contact us by completing and submitting the form below. If you are looking for a specif part number, please include it with your message. Mealguet Jewelry MG Personalized Custom Engraving Plain Stainless Steel ID Bracelets Men Women,Gold Plated,8.3"
Divoti Black Twisted Genuine Leather Medical Alert Replacement Bracelet for Standard Tags w/ Generic Holders -6.5"
Divoti Custom Engraved Lovely Filigree Medical Alert Bracelet -Trio Cable Pink Stainless -White-7.0"
Divoti Custom Engraved Matte Steel Medical Alert Bracelet -Wrapped Link Stainless -Black-6.5"
© 2019 - onlinedatingdirectly.com. All Rights Reserved.